What Is Mean Secure Search over SSL? Using Google Secure Search over SSL (Secure Socket Layer), all your search queries and search traffic are encrypted using SSL so they can't be easily recovered by a third party such as employers and internet service providers (ISPs). How do I get started with Secure Search over SSL? How do I change my browser so it uses Secure Search over SSL? Right-click on the address bar and select "Edit search engines". 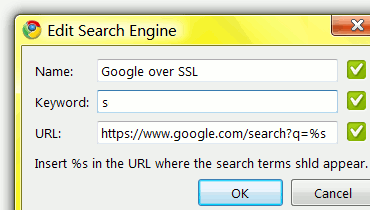 Select Google Secure Search over SSL and click Make Default. Where can I find more information about the Secure Search over SSL? Pic.1 Chrome: Confirm Search Engine addition. Pic.2 Internet Explorer: Confirm Search Engine addition. 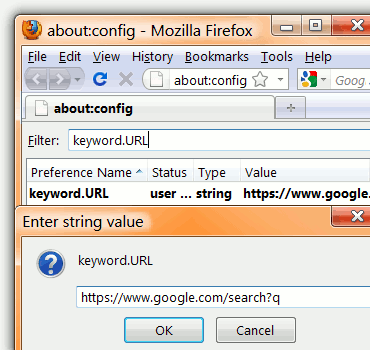 Pic.3 Firefox: Change Address Bar Search Provider.